Following the Kurds in the west of Kurdistan is like watching an ancient myth brought to life. This nation has declared their federal entity even though their brothers in the south of Kurdistan have been unable to achieve that goal for the last two decades. 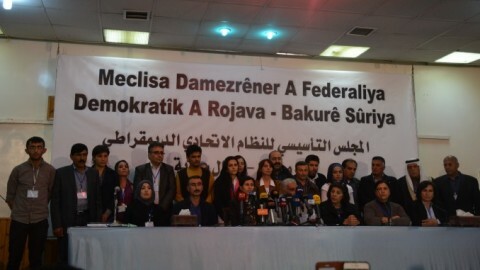 Strong reactions to this declaration have spread rapidly across the Syrian disunited opposition, who have called it a one-sided declaration as well as accusing the PYD (Democratic Union Party) of making it without the consent of their people. The Syrian regime of course wanted Syria to be united and intact. The Turkish government as usual is furious over what is happening in the area. The KRG (Kurdistan Regional Government) leadership and the Barzani clan have not protested publicly but they have hampered envoys from all parts of the south of Kurdistan seeking to go and collaborate in the Kobani celebrations. People in the south of Kurdistan are angry as to why the KDP (Kurdistan Democratic Party) apparatus has taken Turkey’s side on issues relating to the west of Kurdistan. For the first time the Kurds in the west of Kurdistan have transformed the political landscape in a way that counts only on the will of people when they come to claim independence. The Cantons in the west of Kurdistan have found the campaign tougher than they expected, due in large part to opposition to their aspirations coming from the KDP in the south of Kurdistan. The story of the west of Kurdistan is of a victory for a nation suppressed by the Assad regime for the last several decades. It’s a victory for the people who haven’t hesitated to pursue their goals under the current brave leadership. This nation does not want to repeat the mistakes of the south of Kurdistan by putting forward hollow leaders and cowardly politicians. For the first time in Kurdish history, the Cantons of the west are declaring changes in their constitution by enforcing gender equality between men and women in the workplace, as well as in the family in relation to inheritance and marriage. Yet in the south of Kurdistan one of the leaders of the Kurdistan Islamic parties has two wives. This is not allowed in the west of Kurdistan. In the west people follow their leaders and mostly want to do the right thing. The Barzani leadership in the south has treated this issue like a game because they do not understand what it means to be independent. The people of the west of Kurdistan and their leadership have proven that they want to break from the cycle of IS war and to practise politics in a different way. A depressing contrast is evident when comparing the south and west of Kurdistan. When you hear about the people of the west of Kurdistan it’s a reminder that a strong leadership has restored the pride of a broken nation. A key lesson here is that Kurdish leaders in the west of Kurdistan have used polarization as a key strategy: not between Kurds and non-Kurds in the area but between those resistant or sympathetic to invaders.